Men of Galilee, why do you stand looking up to heaven? Alleluia! 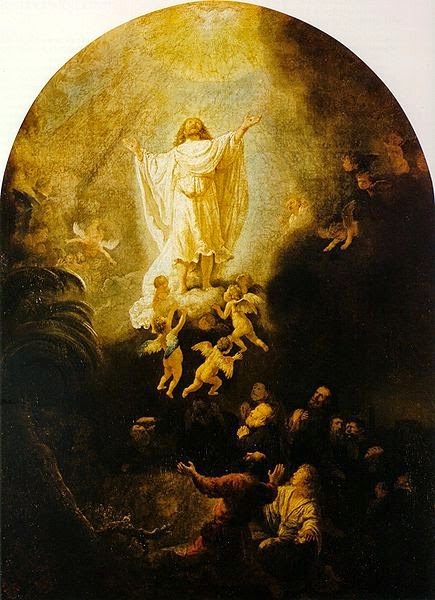 He shall come in the same way as you have seen him going up to heaven, alleluia, alleluia, alleluia! Ps. 46:2. O, clap your hands, all you nations; shout to God with the voice of exultation. V. Glory be . . . COLLECT - O Almighty God, we firmly believe that Your only-begotten Son, our Redeemer, ascended this day into heaven. May our minds dwell always on this heavenly home. Through Our Lord . . . In the former treatise I made, O Theophilus, of all things which Jesus began to do and to teach, Until the day on which, giving commandments by the Holy Ghost to the apostles whom he had chosen, he was taken up. To whom also he shewed himself alive after his passion, by many proofs, for forty days appearing to them, and speaking of the kingdom of God. And eating together with them, he commanded them, that they should not depart from Jerusalem, but should wait for the promise of the Father, "which you have heard"(saith he) "by my mouth. For John indeed baptized with water: but you shall be baptized with the Holy Ghost, not many days hence." They therefore who were come together, asked him, saying: "Lord, wilt thou at this time restore again the kingdom of Israel?" But he said to them: "It is not for you to know the time or moments, which the Father hath put in his own power: But you shall receive the power of the Holy Ghost coming upon you, and you shall be witnesses unto me in Jerusalem, and in all Judea, and Samaria, and even to the uttermost part of the earth." And when he had said these things, while they looked on, he was raised up: and a cloud received him out of their sight. And while they were beholding him going up to heaven, behold two men stood by them in white garments. Who also said: "Ye men of Galilee, why stand you looking up to heaven? This Jesus who is taken up from you into heaven, shall so come as you have seen him going into heaven." Alleluia, alleluia! V. Ps. 46:6 God ascends His throne amid shouts of joy, the Lord is taken up with the sound of trumpets. Alleluia! V. Ps. 67:18-19. The Lord is in Sinai, in the holy place; ascending on high, He has led captivity captive. Alleluia! At that time, Jesus appeared to the eleven as they were at table: and he upbraided them with their incredulity and hardness of heart, because they did not believe them who had seen him after he was risen again. And he said to them: "Go ye into the whole world and preach the gospel to every creature. He that believeth and is baptized shall be saved: but he that believeth not shall he condemned. And these signs shall follow them that believe: In my name they shall cast out devils. They shall speak with new tongues. They shall take up serpents: and if they shall drink any deadly thing, it shall not hurt them. They shall lay their hand upon the sick: and they shall recover." And the Lord Jesus, after he had spoken to them, was taken up into heaven and sitteth on the right hand of God. But they going forth preached every where: the Lord working withal, and confirming the word with signs that followed. 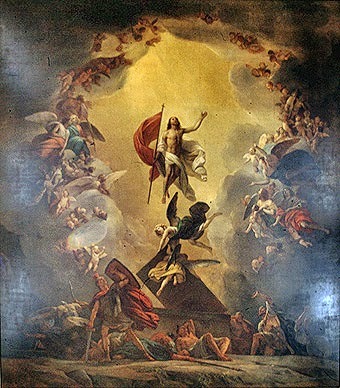 God ascends His throne amid shouts of joy, the Lord is taken up with the sound of trumpets, alleluia!! SECRET - Accept, O Lord, the gifts we offer to celebrate the glorious ascension of Your Son. May Your mercy free us from our present dangers and lead us to eternal life. Through Our Lord . . . Sing to the Lord, who ascends above the heaven of heavens to the East, alleluia! POST COMMUNION - Almighty and merciful God, grant that this Sacrament, which we have received in this visible sacred Rite, may bring us Your invisible help. Through Our Lord . . . While no longer required after Vatican II, the observation of Rogation Days is still encouraged. This year the Minor Rogation, the days leading up to Ascension Thursday, are May 26-28 inclusive. Today is the last day of the Minor Rogation, a day which should be a day of fasting. Declare it with the voice of joy and let it be heard, alleluia! Announce it to th eends of the earth: the Lord has delivered His people, alleluia, alleluia! Ps. 65:1-2. Shout joyfully to God, all the earth; sing a psalm to the glory of His name; proclaim His glorious praise. V. Glory be . . . COLLECT - O God, the source of all good, grant us Your inspiration that we may have proper thoughts, and Your guidance that we may carry them into practice. Through Our Lord . . .
James 1:22-27Beloved: But be ye doers of the word and not hearers only, deceiving your own selves. For if a man be a hearer of the word and not a doer, he shall be compared to a man beholding his own countenance in a glass. For he beheld himself and went his way and presently forgot what manner of man he was. But he that hath looked into the perfect law of liberty and hath continued therein, not becoming a forgetful hearer but a doer of the work: this man shall be blessed in his deed. And if any man think himself to be religious, not bridling his tongue but deceiving his own heart, this man's religion is vain. Religion clean and undefiled before God and the Father is this: to visit the fatherless and widows in their tribulation and to keep one's self unspotted from this world. Alleluia, alleluia! V. Christ has risen and has given light to us, whom He redeemed with His Blood. Alleluia! V. John 16:28. I came forth from the Father and have come into the world. Again I leave the world and go to the Father. Alleluia! At that time, Jesus said to His disciples: "Amen, amen, I say to you: if you ask the Father any thing in my name, he will give it you. Hitherto, you have not asked any thing in my name. Ask, and you shall receive; that your joy may be full. "These things I have spoken to you in proverbs. The hour cometh when I will no longer speak to you in proverbs, but will shew you plainly of the Father. In that day, you shall ask in my name: and I say not to you that I will ask the Father for you. For the Father himself loveth you, because you have loved me and have believed that I came out from God. I came forth from the Father and am come into the world: again I leave the world and I go to the Father." His disciples say to him: "Behold, now thou speakest plainly and speakest no proverb. Now we know that thou knowest all things and thou needest not that any man should ask thee. By this we believe that thou camest forth from God." Bless the Lord our God, you nations; loudly sound His praise. he has given life to my soul, and has not let my feet falter. Blessed be the Lord who has not refused my prayer nor His mercy to me, alleluia! SECRET - Accept the prayers and offering of the faithful, O Lord, and let our love and devotion lead us to the glory of heaven. Through our Lord . . . Sing to the Lord, alleluia! Sing to the Lord, and bless His name; announce His salvation day after day, alleluia, alleluia! POST COMMUNION - Grant that we, who have been fed at Your Heavenly Banquet, O Lord, may desire only what is right and that we may fulfill these holy desires. Through Our Lord . . . There are actually two canonized popes with the name of Celestine - St. Celestine I who reigned from 422 to 432 and St. Celestine V who reigned in 1294. Today's feast of St. Peter Celestine refers to Pope St. Celestine V.
St. Peter Celestine was Pope for five months from 5 July to 13 December 1294, when he resigned. He was also a monk and hermit who founded the order of the Celestines. It is noted that he is one of only a few popes to have ever resigned from office. 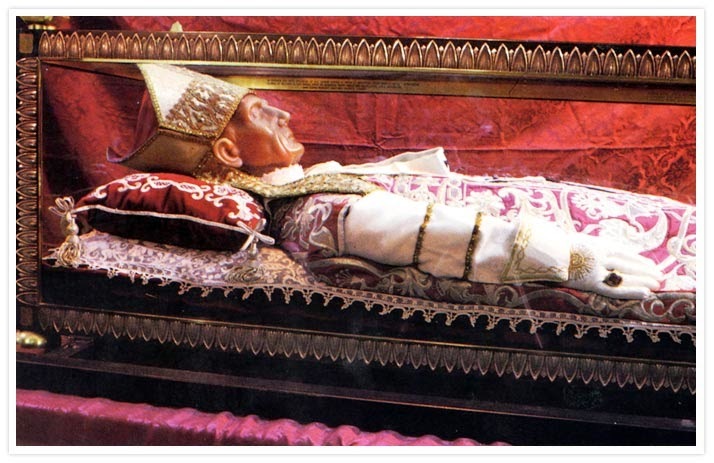 In 1313, St. Peter Celestine was canonized and since then no pope has ever again taken the name of Celestine. To mark the 800th anniversary of Celestine's birth, Pope Benedict XVI proclaimed the Celestine year from 28 August 2009 through 29 August 2010. At Castrum Fumorense near Alatri in Lazio, the birth of Saint Peter Celestine, who, when leading the life of a hermit in Abruzzo, being famous for his sanctity and miracles, was elected Roman Pontiff as an octogenarian, assumed the name Celestine V, but abandoned his office that same year and preferred to return to solitude. O God, who hast raised blessed Peter Celestine to the supreme Pontificate, and also taught him to prefer the virtue of humility, mercifully grant that following his example, we may despise the things of this world, and so merit to attain those rewards which Thou hast promised to the humble of heart. 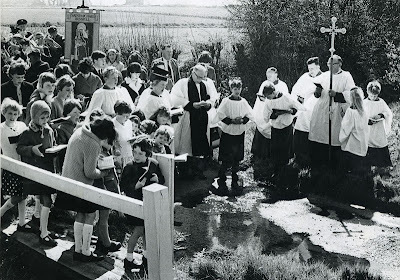 Unfortunately in the past fifty years Catholics have all but forgotten that each Sunday of the Liturgical Year has a special name, taken from the first words of the Introit from the Proper Prayers for the Mass that day. For your edification, I present the Latin names for these Sundays. Some of these names (e.g. Laetare Sunday) are more common than others. You may find the proper prayers on my separate page dedicated to the 1962 Mass Propers by clicking here. Note: The Class distinction listed is from the 1962 Rubrics. Last month during Passiontide I visited the Basilica of St. Josaphat in Milwaukee, a truly beautiful Church and temple of God. Modeled after St. Peter's Basilica in Rome, it features one of the largest copper domes in the world. It is listed on the National Register of Historic Places and is a designated Milwaukee Landmark. In 1929, Pope Pius XI designated St. Josaphat Church as the third minor basilica in the United States, marking it as a place of pilgrimage, special devotion, and historical significance. The Church was built by Polish immigrants and shows the ability for all peoples to build places worthy of the presence of God. How sad that we do not see buildings like this anymore. 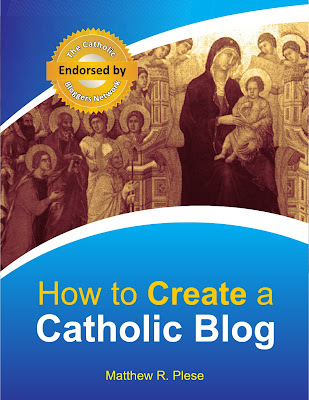 For my recommended books on Catholic architecture, click here to view the list. Just this week the media was abuzz with news of satanists and Harvard students preparing to offer a sacrilegious "black mass." I chose to avoid this topic as my preference is to focus on the positives. In the wake of the media attention, hundreds (if not thousands) of Catholics participated in Eucharistic Adoration and reparation for these grave sins. I wish to present to all of you a true model for the conversion of satanists - Blessed Bartolo Longo. 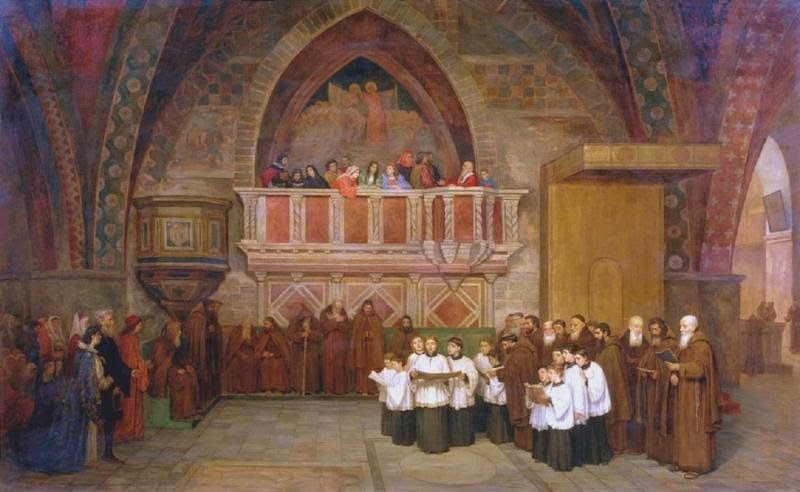 Blessed Bartolo Longo was a Satanist that was converted by the Rosary and thereafter became a third order Dominican. He was a "High Priest" of the satanists before his conversion no less! But he died a saint, and a Knight of the Holy Sepulcher. Blessed Longo wrote of his personal struggles with mental illness, paranoia, depression and anxiety. 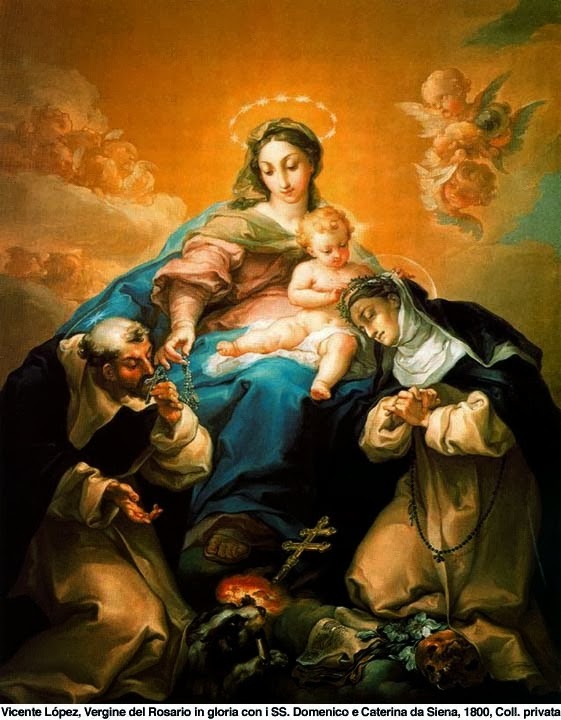 At one point, he noted struggling with suicidal thoughts, but rejected them by recalling the promise of Saint Dominic, "he who propagates my Rosary will be saved." Longo wrote that this promise is what convinced him to encourage public devotion to the rosary. Say a rosary for the conversion of those who wished this blasphemy, or live in Satanism. And let us pray for Blessed Longo's intercession. 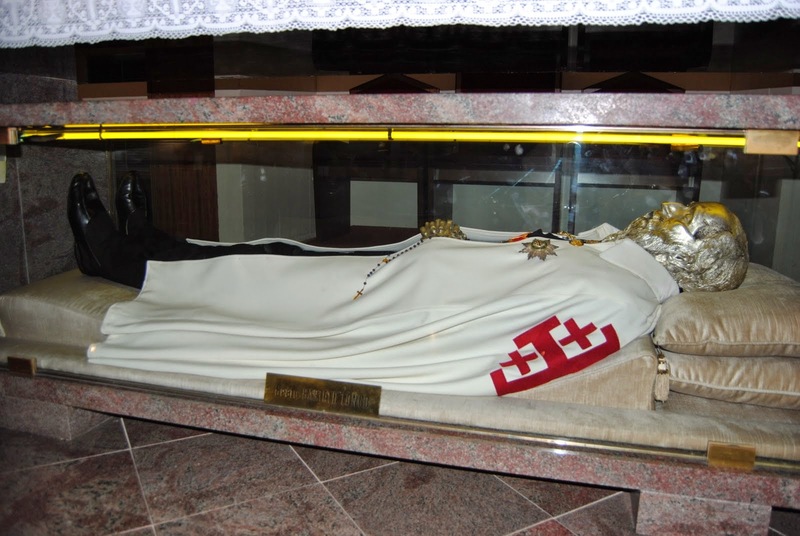 The tomb of Blessed Bartolo in the Basilica of Our Lady of the Most Holy Rosary in Pompei. We are in the middle of the important month of the Holy Rosary, month of the great victories of Our Blessed Lady, through the Holy Rosary. Sr. Lucy said that Our Blessed Lady has given more power to the Holy Rosary in view of the hard time that we were going to live, which are now, which is this terrible crisis in the Church. 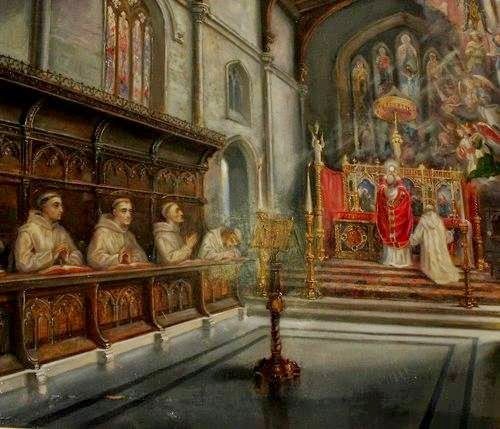 It is a great grace to be able to attend the Traditional Latin Mass once a week, or once or twice a month. But on the other days, are you faithful to your daily rosary? 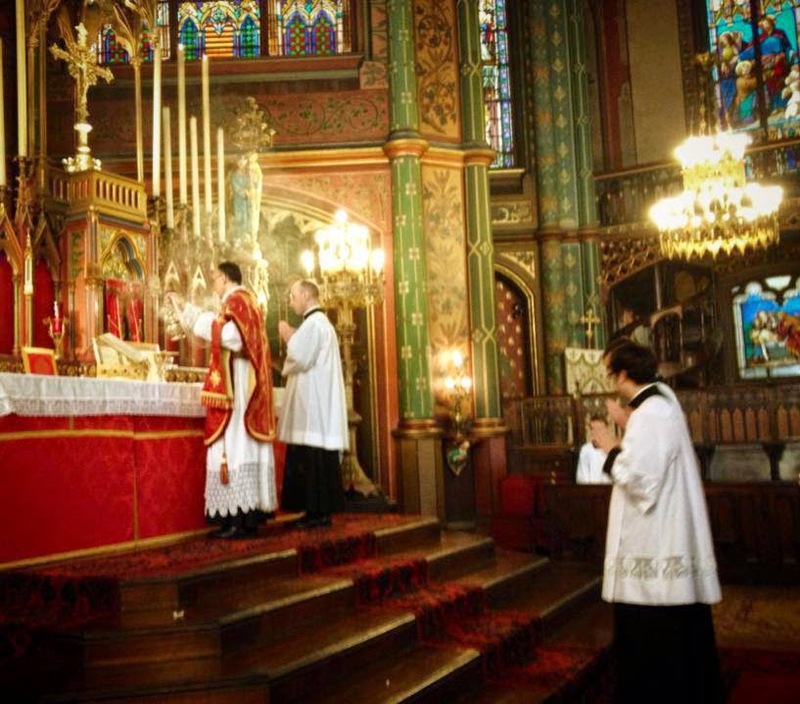 It’s not enough to come to the Traditional mass in order to go to heaven. You must do your personal part too to ask for God’s grace seven days a week, and that part is essentially prayer, specially the prayer of the Holy Rosary. “He who prays will be saved, he who doesn’t pray will be condemned”, St Alphonsus says. To encourage you to be faithful to your daily rosary especially during this month of October, I would like to remind you, first, of the origin and history of the Holy Rosary, and then, in a second point, why the Holy Rosary is still so important for our present day history. We need to explain Our Lady’s words. Firstly, she calls the battle St Dominic was waging against heresy, ‘a kind of warfare’ . Indeed there has always been a deadly fight between truth and error, virtue and vice. Among other things, the Albigenses were destroying marriage and making people live in sin, and in order to save the souls deceived by these heresies, there had to be a serious fight, a real warfare. Then, Our Lady speaks of a ‘battering ram’, which is very symbolic too. A battering ram is a large beam, sometimes a whole tree, handled by many men, or by a kind of a structure, that is used to open a large gate, or to make an opening in a wall. It only works with the repetition of blows on the gate or the wall. 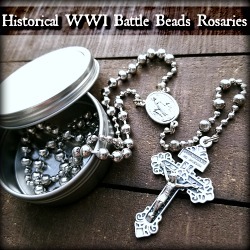 She compares the Rosary to a battering ram: all these Hail Mary’s knock down the power of the devil to weaken it. We can also say that they knock on the Heart of God as well to obtain the opening of the flood of graces. “Knock and it shall be open”, Jesus said. Thirdly, Our Lady calls the Rosary “the Angelic Psalter”. You are familiar with the book of Psalms, mostly written by King David, in the Old Testament. There were 150 Psalms which the monks recited every week and still do, in fact. So the word Psalter means 150. 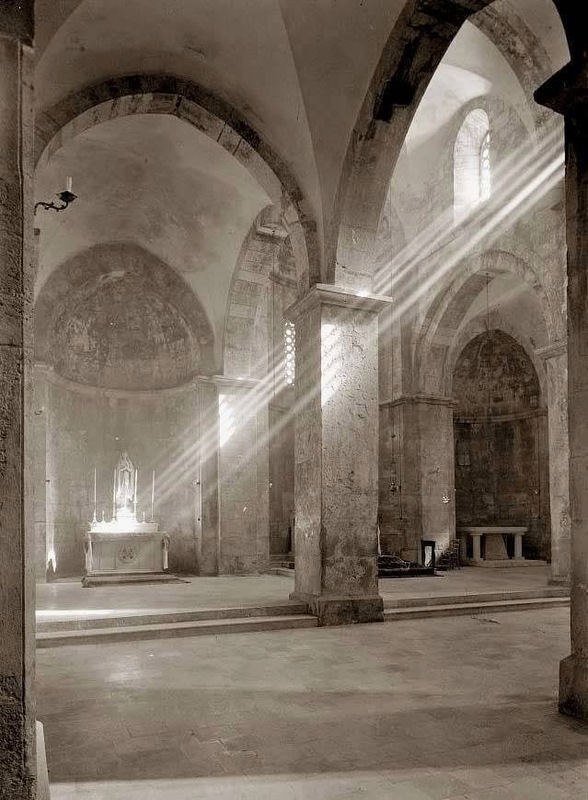 Some of the monks in the monasteries who could not read or write would replace the recitation of the 150 Psalms, by 150 Our Fathers or Hail Marys. The Ave Maria is called the Angelic Salutation. So, when Our blessed Lady uses the words “The Angelic Psalter “and “My Psalter” , she refers to the 150 Ave Maria of the full rosary. Our Lady finally says that the Angelic Psalter “is the corner stone of the New Testament”. The whole mystery of the Redemptive Incarnation began with the Annunciation, which opened with the Ave Maria. Our Lady’s consent to the words of the Angel Gabriel – “Behold the Handmaid of the Lord” - was a consent to the Incarnation of the Word of God, to become the Mother of God and our Mother, and also to be the Woman that would be in enmity with the serpent and crush his head. And St Dominic did it! And thousands of heretics were converted. A few hundred years later, Louis XIII, a French king, did it also in a war against the Protestants, and in thanksgiving for the victory, he built the famous church of Our Lady of Victories, in Paris. The feast of Our Lady of Victories is on … October 7 th ! Later still, the first Dominican Pope, St Pius V used the rosary in the crusade against the Muslim Turks who were dangerously threatening to invade Europe. And the Rosary won again. It was October 7 th , 1571. And the list of the victories of the Rosary is long and continue until our own days. Is it surprising then that at Fatima, Our Blessed Lady urged the recitation of the rosary against the plague of communism? Whether it is against the Albigenses, the Protestants, the Muslim or the communists, “in this kind of warfare, our ‘battering ram’, the Rosary, must always be used. We have the promises of Our Lady and history on our side to prove it. Before I come to the second point, our own contemporary history, I want to remind you of a detail in the history of Fatima. The children of Fatima understood that the popes would have a very important role to play to obtain or to delay the triumph of the Immaculate Heart. They saw something truly tragic about this, so that they were constantly adding to their sacrifices: “for the conversion of sinners and for the Holy Father”. Did they see that 7 popes would refuse to obey Our Lady’s request to consecrate Russia to the Immaculate Heart, and that as a consequence Russia would spread its errors, and would cause hundreds of millions of deaths? Did they see, as Cardinal Ciappi said, he who read the Third Secret of Fatima, that “the apostasy would start from the highest summit of the Church”? That would explain certain of the words and attitudes of the children of Fatima, and also why Sr Lucy was like paralyzed when it came to write down this Third Secret, in January 1944. Second Point: the need of the Rosary for our present history. “And for the Holy Father!” O, yes, My Dear Brethren, we need to say the rosary, many rosaries for the Holy Father! 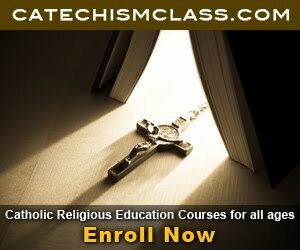 The situation in the Church is getting worse, and the present Holy Father, who is not a Father of Vatican II, like pope Benedict was, but a son of the Council, is showing in an alarming way how far can the principles of the Council go. So many of his acts show that sadly, very sadly, he is imbued with modernism. For example, in his first encyclical on faith, Lumen Fidei, he confuses faith and charity. These are two different theological virtues: faith is in the intellect and has for object the truth revealed by God and proposed by the Church, while Charity is in the will and has for object God as the supreme good. Now the Holy Father in an encyclical – but now encyclicals seem to be more for the world at large than for the bishops, like they used to be - says this: “Faith knows in the measure that it is linked to love, in the measure where love itself carries a light”. When you read the encyclical, you do get the message that faith is merely a religious feeling based on love. Well, that is exactly how St Pius X described modernism. Then, he has announced that he will canonize two of the popes of the Council: Pope John XXIII and Pope John Paul II. For the first one, they have even dispensed from the miracle which is the sign that the person has reached heaven. For John Paul II, I encourage you to read the book: Doubts on a Beatification which was published by Angelus Press. Pope John Paul II has a different notion of the three virtues of Faith, hope and charity. Such canonizations – if God allows them – change the very notion of holiness, which is one of the four marks of the Church, and the goal of these canonization is truly to canonize Vatican II and its errors which are destroying the Church. I cannot speak of everything which Pope Francis has already done, such as the terrible and scandalous World Youth Days in Brazil, last August, or his recent long interview with the Jesuits, where he says that Vatican II is irrevocable. I simply want to mention another more recent interview given on October 2, to the Italian Newspaper “Reppublica”, which is run by an openly atheist editor. Mr. Scalfari, the editor of the newspaper, asked the pope if there was a unique vision of what is Good, and if so, who can decide this? The pope replied: “Every human being possesses his own vision of what is good, but also of what is evil. Our task is to encourage him to follow the way shown by what he estimates is good.” And he insisted: “And I am ready to repeat this. These worlds are terrible. They eliminate the Ten Commandments, and the whole role of the Church, guardian and sole interpreter of the Ten Commandments. My Dear Brethren, do say your rosary every day, as Our Heavenly Mother has urged us, pray for the Holy Father. As you can see, his mind is filled with the modern errors. Pray the rosary for him. This is the best way for us to help him. And keep yourself free from sin. Go to confession frequently. Be faithful in your duty of state. Our Lady of the Rosary, pray for us and “for the Holy Father”! Today is the First Friday of May. Because today is the first Friday of the Month, many Catholic parishes will have special Masses today for the First Friday Devotion. Beginning on December 27, 1673, through 1675, Our Lord appeared to St. Margaret Mary Alacoque asking her to receive Him in Holy Communion on the first Friday of every month and to meditate on His passion from 11:00 PM to 12:00 midnight each Thursday. 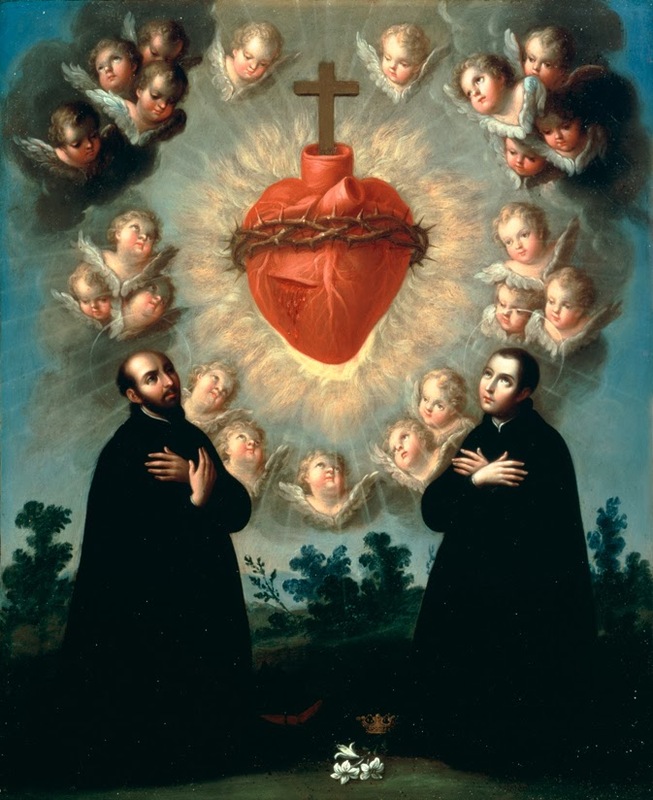 He also revealed to her twelve promises for all who are devoted to His Sacred Heart; he asked for a Feast of the Sacred Heart to be instituted in the liturgical calendar of the Church. Our Lord appeared to St. Margaret Mary Alacoque with twelve promises for those devoted to His Most Sacred Heart. 1. "I will give them all the graces necessary in their state of life." 2. "I will establish peace in their homes." 3. "I will comfort them in their afflictions." 4. "I will be their secure refuge during life, and above all in death." 5. "I will bestow a large blessing upon all their undertakings." 7. "Tepid souls shall grow fervent." 8. "Fervent souls shall quickly mount to high perfection." 10. "I will give to priests the gift of touching the most hardened hearts." 11. "Those who shall promote this devotion shall have their names written in My Heart, never to be blotted out." 12. "I promise thee in the excessive mercy of My Heart that My all-powerful love will grant to all those who communicate on the First Friday in nine consecutive months, the grace of final penitence; they shall not die in My disgrace nor without receiving the Sacraments; My Divine heart shall be their safe refuge in this last moment." O Most Holy Trinity, Father, Son and Holy Spirit, I adore thee profoundly. I offer thee the most precious Body, Blood, Soul and Divinity of Jesus Christ, present in all the tabernacles of the world, in reparation for the outrages, sacrileges and indifferences by which He is offended. By the infinite merits of the Sacred Heart of Jesus, and the Immaculate Heart of Mary, I beg of thee the conversion of poor sinners. Amen.